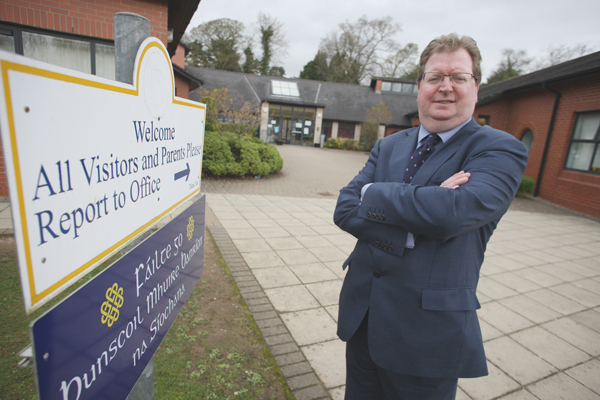 A LOCAL councillor has claimed that the Department of Education is “gerrymandering school funding” after Our Lady Queen of Peace Primary School in Dunmurry lost its Extended Schools Funding. Principal Cathal O’Doherty said the school had been notified by the Department that their funding “had been completely withdrawn” due to a new way in which the Neighbourhood Renewal areas are calculated following their October census and described the decision as a “disaster”. “This funding goes towards our breakfast club, afterschools and fun club, which have been set up to help the working parent. It’s the parent again who will be penalised due to this decision as we will have to go to them to ask to make up in some way the removal of this funding. “We had £17,500 given to us for Extended Schools in 2017-18 and we actually spent over £22,000. Already this is a gap of £4,500 which has come out of our own budget. “I had written out to our parents to inform them of what was happening and the immediate impact of this cut of funding will be that there will be no afterschool clubs in this third term outside of breakfast and fun club which parents rely upon but which will now run to a loss. “Come September we will have to make the breakfast club, fun club and any other after school activity self sustaining which will inevitably lead to a rise in price. SDLP Councillor Brian Heading said that parents will now have to face “further financial pressure”. “The Department of Education are using information gathered by the government statistics branch and have applied this information to gerrymander school funding – it’s as simple as that. The spokesperson added: “The qualifying thresholds for Extended Schools have remained unchanged for the last number of years, however in 2018/19, eligibility against the area based criterion has been determined using the new updated Northern Ireland Multiple Deprivation Measure (NIMDM) introduced by the Northern Ireland Statistics and Research Agency (NISRA) in November 2017. “The NIMDM 2017 which has been adopted is now the official measure of deprivation across Northern Ireland, replacing the earlier NIMDM 2010 rankings. This has had an impact on some previously qualifying extended schools in that they no longer meet the criteria for funding and will have to exit the programme in 2018/19, whereas some schools not previously in receipt of ES funding are now entitled to receive such support this year. “In respect of Our Lady Queen of Peace PS, according to the last available Census (October 2017) the school had 42% of its pupils drawn from either a Neighbourhood Renewal Area or the 30% most deprived Super Output Areas (MDM/Education Domain) and 18% of pupils with a FSME thereby failing to meet the applicable eligibility thresholds for ES funding in 2018/19.